For the filling you’ll need: 5 Granny Smith Apples, 1 tub fresh blueberries, 100g golden brown sugar, 1 tsp ground cinnamon. For the crumble topping you’ll need: 150g Quick Cooking Oats. 125g soft brown sugar, 50g cake flour, 1 tsp ground ginger, 100 g cold butter – grated. Method. Preset the oven to 180C. Have ready a 2litre baking dish painted out with melted butter. In a bowl, mix together the apples, blueberries, sugar and cinnamon. Place in the prepared baking dish. 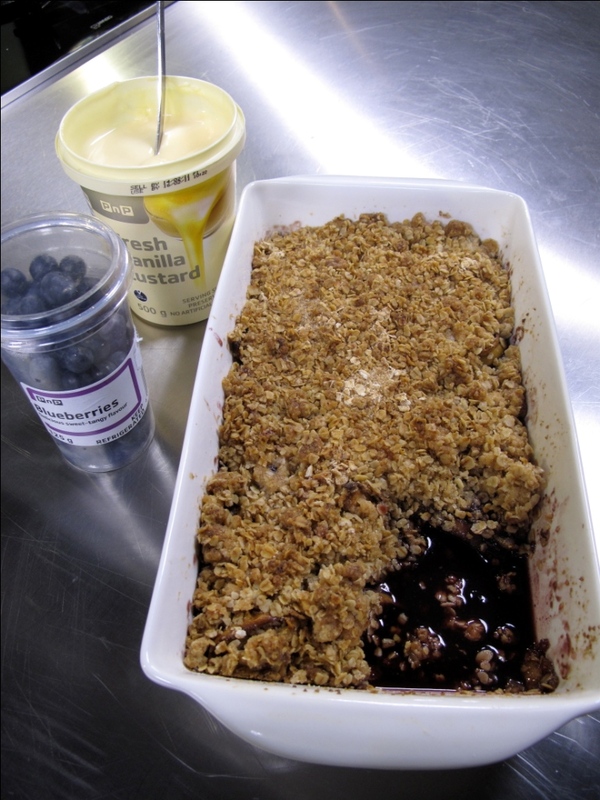 Using your hands, mix together the ingredients for the crumble topping and strew them over the apple mixture. Bake in the preset oven for 25 – 30 minutes or until the top is a rich golden brown. Serve with vanilla custard.